Looking for a fun way to support local crafters and get your holiday shopping done early this holiday season? 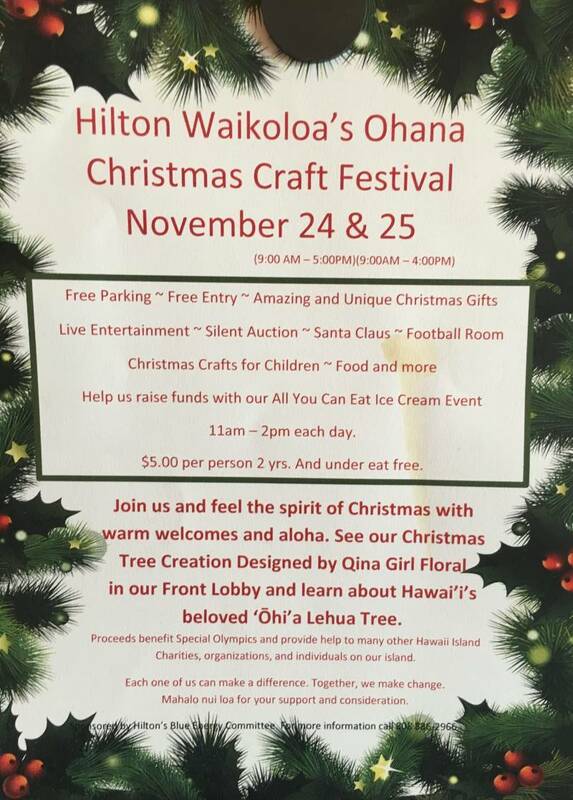 The Ohana Christmas Craft Fair is a wonderful way to do just that. This is a free event being held at the Hilton Waikoloa on November 24th and 25th from 9:00 AM to 5:00 PM. Enjoy everything from live entertainment to a silent auction. There will even be an all you can eat ice cream event from 11:00 to 2:00 each day for a small fee of $5.00 per person. Keiki 2 years and under eat for free. Proceeds from this event will benefit the Special Olympics as well as many other Big Island charities.